Internet Explorer ver.4 or above, Netscape Navigator ver.4.2 to 4.8, Netscape Navigator ver.6. - Dionaea muscipula is the famest one and well spread in many nurseries. The most famous but contrary to what it is said not the easiest one. At the beginning I've got some difficulties with it. In a flat light is often insufficient to obtain the red colour inside the jaw. After a winter outside with a short period of frost (under protection of shelves covered with plastic film, the whole on the veranda), my four plants are growing well but the summer heat (over 91.4°F during the day) had seriously injured them. So it seems that direct sunlight and fresh air are necessary to have nice plants. In ever cases water is essential, pure and abundant (except in winter during rest period). For soil I first used a mixing between "terre de bruyères" (acid soil from a part of France) and "sable de Loire" (sand from river Loire without calcium) but it contained too much minerals. Now I use only blond peat (sphagnum moss peat) with a little part of "sable de Loire" or perlite. About food Mother Nature is here to provide anything necessary. The most convenient preys seems to be small flies but anything with the same size that fly or run is good too. It flowers easily with sunlight but flowers are not very pretty. Just keep it if you want seeds. I did it just to try but seeds are not the better and faster way to obtain a new dionaea. It's really easier to separate a big one in two. I did it too and I now have many nice plants even if it's take some time to grow up, it's not really fast. The week points of the dioneae seem to be rotting and mould (mold for American people). Because it's not growing up fast, needs sun light and doesn't like warm (like in a flat in summer) I don't believe it's an easy plant as it is said in books. Of course if you got a healthy adult one you have no problem anymore, it's strong. But when you buy one it's more often a young one and not always healthy! If you are patient you'll have much pleasure looking at it growing and eating, just don't play too much with its jaws it's only working four or five times. M.K. JANARTHANAM & A.N. HENRY, BLADDERWORTS OF INDIA, Botanical Survey of India, Calcutta, 1992. ISBN N/A. It's a good description of the badderworts of India. There are many determination keys too. It's the same kind of book as Taylor's one but specialised on India. LOWRIE Allen, CARNIVOROUS PLANTS OF AUSTRALIA, VOLUME 2, UNIVERSITY OF WESTERN AUSTRALIA PRESS, 1989. ISBN 0-85564-299-8. Books from Allen LOWRIE are references to find any information about environment and plants of Australia. Each plant is scientifically described, located and illustrated. Tome 2 is only about pygmy droseras. If like me you are interesting in it this book is very precious otherwise it is useless. Unfortunately it's very difficult to find it, and very expensive too! LOWRIE Allen, CARNIVOROUS PLANTS OF AUSTRALIA, VOLUME 3, UNIVERSITY OF WESTERN AUSTRALIA PRESS, 1998. ISBN 1-875560-59-9. This is the last book from Allen LOWRIE, see tome 2. This one is about tuberous droseras, utricularias and some pygmy droseras of Australia. It's as precious as tome 2 but easy to find everywhere. SALMON Bruce, CARNIVOROUS PLANTS of New Zealand, Ecosphere Publications, Auckland, 2001. ISBN 0-473-08032-X. Donald E. Schnell, Carnivorous Plants of the United States and Canada, second edition, Timber Press, Portland, 2002. ISBN 0-88192-540-3. PIETROPAOLO James and Patricia, CARNIVOROUS PLANTS of the World, Timber Press, Hong Kong, 1999. ISBN 0-88192-356-7. This book is about everything concerning carnivorous plants.For each genus some information and easy to use cultivation advices are provided.There are some details too about few species but mainly what you can find on the north American market. M. CHEEK & M. JEBB, Flora Malesiana, Serie I - Seed Plants, Volume 15 - 2001, Nepenthaceae, Nationaal Herbarium Nederland, Leiden, 2001. ISBN 90-71236-49-8. Taxonomic revision of the family Nepenthacea around Malaysia. There are determination keys and a precise description of each specie with sometimes a very nice botanic illustration. Unfortunately there isn't one for each plant and there is no photo in the book. CLARKE Charles, NEPENTHES OF BORNEO, Natural History Publications (Borneo), Kota Kinabalu, 1997. ISBN 983-812-015-4. It's a reference about nepenthes with lots of original information coming from recent research results. Information are scientific ones but easy to read and understand. It's a really good book but a little bit expensive. KURATA Shigeo, NEPENTHES OF MOUNT KINABALU, SABAH NATIONAL PARKS TRUSTEES, Tokyo, 1976. ISBN N/A. A small old book with basic information about nepenthes. It's something like a summary of S.KURATA's researches. It's very cheap. CLARKE Charles, NEPENTHES OF SUMATRA AND PENINSULAR MALAYSIA, Natural History Publications (Borneo), Kota Kinabalu, 2001. ISBN 983-812-050-2. TAYLOR Peter, THE GENUS UTRICULARIA - a taxonomic monograph, Kew bulletin additional series XIV, Royal Botanic Garden, Kew, 1989. ISBN 0-11-250046-3. This is the result of a great work and very professional. Descriptions of full utricularia genus are rather accurate. Each specie is illustrated by some drawings (no photo) of each part of the plant. If you are interesting in this genus you should have this book on your shelves. D'AMATO Peter, The SAVAGE GARDEN, Cultivating carnivorous plants, TEN SPEED PRESS, Berkeley, California, 1998. ISBN 0-89815-915-6. 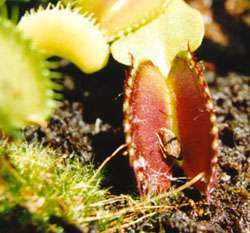 The author is the owner of California Carnivores one of the biggest carnivorous plants' grower in the world. His book tells you all you have to now about carnivorous plants cultivation. You will discover many species too. It's a book to have in your bookcase. MABUCHI Michiaki, Welcome to the Wonderful world of the MEXICAN PINGUICULA, 'SETHOS' insectivorous plants home garden, Kyoto, 1998. ISBN N/A. It's a small "book" about Mexican pinguiculas. At first there are some photos and then some quick species description. Unfortunately printing quality is far from professional and photos loose most of their interest. LECOUFLE Marcel, Comment choisir et cultiver vos PLANTES CARNIVORES, BORDAS, 1989. ISBN 2-04-018457-0. Many plants presented in a practical way. There are some nice photos too and a good bibliography (mainly in english). STAROSTA Paul, LABAT Jean-Jacques, L'univers des PLANTES CARNIVORES, Du May, 1993. ISBN 2-906450-74-X. Really pretty photographs in large size that could'nt let you indifferent. SLACK Adrian, LES PLANTES CARNIVORES, Comment les cultiver?, DIAGONE-CALMANN-LEVY, 1988. ISBN 2-907470-00-0 Diagone, ISBN 2-7021-1732-5 Calman-Lévy. Rather complete about general cultivation principles but it's difficult to find any precise information about a particular specy. The organisation of families and kinds is well-described and the hybrids are well-inventoried. There is an english version of this book. M.BAFFRAY, F.BRICE, Ph.DANTON, J.-P.TOURNIER, Nature et Culture des Plantes Carnivores, EDISUD, 1989. ISBN 2-85744-416-8. Great book about the whole carnivorous plants. Logical presentation (often with tables) which alows to find informations very easily. For each family you can get informations about natural environnement which is fairly rare. This book seems to have been writen by real scientists. I recommend it to you. BLONDEAU Gérard, PLANTES CARNIVORES, EDITIONS DE VECCHI, 1996. ISBN 2-7328-0816-4 & ISBN 2-7328-1485-7. Very practical, each plant is describe with an illustrated "card". Some small plans explain general principles about feeding, cultivation, etc. There is a new 2001 edition. ISBN 2-7328-1485-7. It has a different and hard cover but the text inside is the same. LABAT Jean-Jacques, PLANTES CARNIVORES, Comment les cultiver facilement, EDITIONS ULMER, Paris, 2000. ISBN 2-84138-118-8. Very good and well illustrated cultivation guide. There are many details about important parameters to succeed in cultivation. You have to buy it (if you understand French) if you want to start on good basis and if your no more a rookie it will be of interest to you as species shown in this book are not only the common ones. K. & M.KONDO, Carnivorous Plants of the World in Color (genshoku shokuchu shokubutsu), Ienohikari Association, Tokyo, 1983. ISBN 4-259-53549-8. Wonderful small book well-illustrated. For each specy there are some photos and a short description (in Japanese!). Photographs are often took in natural environnement which makes them particulary interesting. At the end you can find (always in Japanese) some parts of experiences about prey catching, reproduction, etc.. There is an impressive scientist bibliography too... in english! KAKO Satoshi, Kimi ha tanukimo wo shitte iru ka? - Shokuchu shokubutsu to bokutachi no kankei, Komine shoten, Tokyo, 1999. ISBN 4-338-16102-7. An introduction to carnivorous plants for young children well illustrated with drawings. The Japanese common names origin is explained with humour. Shokuchu shokubutsu kenkyukai, Sekai no shokuchu shokubutsu - Amazing world of the Carnivorous Plants, Seibundo shinkosha, Tokyo, 2003. ISBN 4-416-40305-4. YOSHIDA Akira, Sekai no shokuchu shokubutsu to hushigi shokubutsu, Seibido, Tokyo, 1997. ISBN 4-415-03946-4. 'The world of carnivorous plants and other mysterious plants' has been writen for children. It speaks of particular plants from our planet. One chapter is about carnivorous plants. Not very precise but easier to read and the other plants are not without interest. There is a new edition, 1999, with hard cover (image on the right), ISBN 4-415-00841-0. YAMAKAWA Gakusaburo, Shokuchu shokubutsu, Hoikusha, Tokyo, 1997. ISBN 4-586-50446-3. 'Carnivorous plants' is a small book which most important part is composed with photos and short describing texts. the other part is an explanation with some drawings about different kind of traps. Interesting even if Japanese does not make it easy. SHIMIZU Kiyoshi, Shokuchu shokubutsu no himitsu - kagaku no arubamu 19, Akane shobo, Tokyo, 2000. ISBN 4-251-03319-1. This book is an introduction to the main genus of carnivorous plants and especially their way to catch preys. It is well illustrated with numerous good photos and a map of Japan with localisation of the plants. Shokuchu shokubutsu kenkyukai, Shokuchu shokubutsu, shurui to saibai, Seibundo shinkosha, Tokyo, 1996. ISBN 4-416-49600-1. 'Carnivorous plants, species and cultivation' has one part made of photos and the other one describes the different kinds and their cultivation. Photos are nice and the part about cultivation seems to be interesting. J.YAMAMOTO, F.FUJIKAWA, Y.NAKAMURA, N.YAZAWA, Wandafuru purantsu bukku 2 - Saboten, tanikushokubutsu, eapurantsu, shokuchu shokubutsu, Media Factory, Tokyo, 1998. ISBN 4-88991-517-6. A book about cactus, succulents, air plants and carnivorous plants. For the main genus you'll find information about flowering, repoting and watering with few photos. You are the 71649th visitor since January the 1 of 2002!